All of us will or have experienced problems with our engine's drive belts. Whether it's because of the belts themselves, the pulleys being worn, or mis-alignment, we'll all have a problem with our over 30 year old cars. Our cars are fitted exclusively with V-type belts and although they are the best suited for driving accessories. They also can develop squealling, abnormal wear, glazed surfaces and other problems. Developed in 1917 by John Gates, founder of the Gates Rubber Company, they are generally endless belts, meaning that the ends are formed together without the use of staples or other mechanical devices to join them. Their cross-section shape is trapezoidal. The "V" shape of the belt tracks in a mating groove in the pulley, with the result that the belt cannot slip off. The belt also wedges into the groove as the load increases - the greater the load, the greater the wedging action - improving torque transmission and making the V-belt an effective solution to the more traditional flat belts of the era which tended to slip at predictable intervals which meant more maintenance was needed to keep them adjusted. V-belts solved the slippage and alignment problem. And up until just recently it was the basic belt for power transmission in the automobile.They provide the best combination of traction, speed of movement, load on the bearings, and long service life. 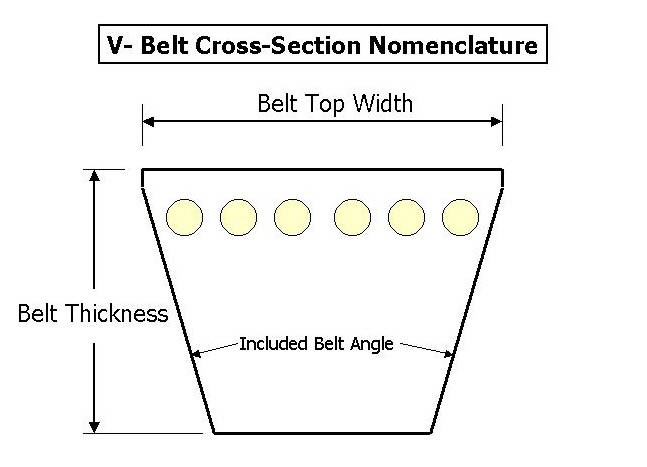 Needing less width and tension than flat belts, V-belts are better than flat belts with their small center distances and high reduction ratios. V-belts need somewhat larger diameter pulleys for their larger thickness than flat belts would need. The modern engines of the 21st century use flat cogged belts. First, although some accesories can tolerate belt slippage, such as water pumps, other more important belt driven things like the camshaft or belt driven injection pumps can't tolerate any slippage at all without failing to operate correctly. Sometimes these belts are external belts and are subject to the weather and other adverse conditions. If a belt driven camshaft has the belt jump even one cog (a tooth) it will cause the engine to run badly. We all know this. It happened with the nylon gears that drove the cams on our engines. The first part of these V-Belt articles will deal with these items. Part Two will be about the proper way of adjusting the belts, and Part Three will be about belt selection and sizing for our cars. Whether the engine leaks fluids or not is the first thing to check for when having drive belt problems. Oil, Power Steering fluid, ATF, Anti-Freeze, and even Brake Fluid leaks will eventually find their way onto a belt. Fatigue, more so than abrasion, is the culprit for most belt problems. This wear is caused by stress from rolling around the pulleys. High belt tension; excessive slippage; adverse environmental conditions; and belt overloads caused by shock, vibration, or belt slapping all contribute to belt fatigue. Certain environmental factors must be considered when drive performance does not meet expectations. These include high or low temperature extremes, dust, sand, grime, chemical vapors and leaking lubricants. Harsh weather, high humidity and sunlight exposure also can decrease drive performance. When installing new belts, never use force or pry them onto pulleys. This could break the internal cord reinforcement or damage the outside of the belt. Rather, reduce the center distance on the drive or release the idler to relieve the tension. If necessary, remove one of the pulleys to install the belt. After the new belts have been installed and tensioned, rotate the drive by hand for a few revolutions, and re-check the tension. If necessary, adjust the tension and secure the motor mounting bolts to the recommended torque values. Never crimp (bend the belts below their minimum recommended diameter) or twist belts. This too could damage the internal cord reinforcement. Always store belts, whether new or used, in a cool to room temperature area, preferably vertically. Never apply any type of grease or lubricant to them to try and prevent squealing! It's okay to apply a small amount of Belt Dressing/Conditioner, but remember that too much is worse than none at all. A common misperception is that metal pulleys and sprockets never wear out. Gates application engineers report that a significant percentage of the belt drive problems they investigate can be traced to something wrong wit, often exacerbating the problem by becoming very loose and causing slippage which brings it's own problems to the forefront. Place a straight edge such as a straight piece of aluminum or steel stock along the outside face of both pulleys. Misalignment will show up as a gap between the outside face and the straight edge. Pulleys and shafts can be checked for tilting with a bubble level. Pulley misalignment may result from the engine's crankshaft and driven machine shafts not being parallel, the pulleys not being properly located on the shafts, and the pulleys being tilted due to improper mounting of the accessory. Belts require very little maintenance. However, all belt types must be properly tensioned initially. Additionally, V-belts should be rechecked periodically (no more than three to six months). For newly installed and tensioned V-belts, a run-in procedure is recommended. This process consists of starting the drive, letting it run under full load and then stopping, checking and retensioning to the recommended values. Running belts under full load allows them to seat themselves into their pully groves. When troubleshooting for improper V-belt tension, make sure to look for glazed or hardened belt sidewalls that indicate the belt is slipping in the drive. Part Two will continue from here and give explicit instructions for adjusting the belts correctly.